To create the query we are going to select a specific location using a geo-coordinate and set a radius in km. The query then will then populate the timeline with all the events that have their location set within the defined radius. This means we can explore the local history of any location, you might want to make a timeline of the area where you were born, or where you live, or maybe from a famous landmark or building. Here are a couple of queries to give you an idea. During this tutorial I will use the example above of 3km radius from Big Ben, London. The first part of this tutorial will show you how to use Google Maps to get the geo-coordinates needed for the query. If you already know how to find geo-coordinate you can jump to part 2. 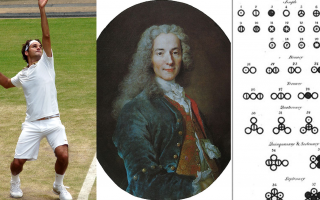 NOTE: for the query you need longitude and latitude coordinates expressed in decimals, not degrees, minutes, second as used in Wikipedia articles. Step 1 – Find a location of interest on Google Maps. 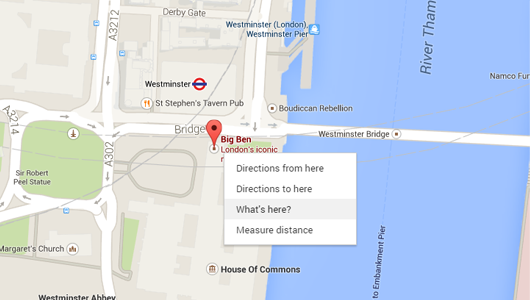 Open Google Maps and navigate to the place of interest, in this case Big Ben, London. An information box will appear under the search box on Google Maps, in the bottom of the box there are 2 sets of numbers, these are the geo-coordinates for that location. Select the numbers and copy them to the clipboard, or make a note of them somewhere, you will need them for the query. The geo-coordinates for Big Ben, which is actually the nickname for the Great Bell of the clock in the Palace of Westminster, are 51.500732, -0.124239. NOTE: If you are using the classic version of Google Maps when you chose what links here the coordinates appear in the search box, not in the drop down info box as shown above. This actually makes copying the coordinates much easier. Also sometimes Google Maps opens in classic mode when you follow a link to a location. 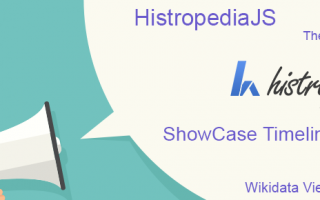 To run a Wikidata query on Histropedia we simply have to append the query to the Histropedia timeline URL. The query URL to create a location based timeline can be broken into 4 parts as shown in the diagram below. To create the timeline simply copy and paste the URL into a web browser. Click here to run the example query of a 3km radius from Big Ben, London. Our timeline creating robot, Histrobot, will run the query on Wikidata and add the results straight to the timeline. Create timelines based on defined locations such as countries, cities, towns and venues. Because these queries work on a radius from a single location they are not always ideal for towns or cities, which rarely have perfectly circular boundaries. For larger towns and cities there may be a Wikipedia category that can be used to make some interesting timelines, however we can also use a Wikidata query to create this type of timeline, which can include results for things such as books or films whose narrative was set in a specific city or country. It also allows for people and other types of events that don’t have their location set as a geo-coordinate to be included in the timelines. In the next tutorial we will look at this second type of location based timeline and explore some of the different options for further filtering the queries. are in place which help homeowners adopt their own solar powered energy systems. relied to produce this kind of their time.